The boxing world was rocked by not one, but two devastating stories. First, late Sunday night came word that former multiple time champion (in three different weight classes) Johnny Tapia was found dead at his home in Albuquerque, NM. He was 45. Tapia had a rough life, some of which was out of his control and some of which wasn’t. His father was murdered while his mother was pregnant with him. Then he was orphaned at just 8-years-old after his mother was kidnapped, raped, hanged, repeatedly stabbed, and left for dead. She died four days later in the hospital without regaining consciousness. It was after all this that he turned to boxing at the age of nine. He also battled his own demons which usually manifested itself in the form of a cocaine addiction. One instance was in 2007 when he apparently, purposely, overdosed on cocaine and was hospitalized. Just days later his brother-in-law and nephew were on their way to see Tapia in the hospital and while on the way they were killed in an automobile accident. Tapia had a stellar amateur career with two National Golden Gloves championships (1983 & 1985). His pro career was just as impressive. He was at different times champion at 115 lbs, 118 lbs, and 126 lbs. Before losing his first fight to Paulie Ayala, Tapia had run his record to a sparkling 46-0-2, with 25 knockouts. His two exciting fights with Paulie Ayala (their first bout in 1999 was Ring Magazine’s Fight of the Year) and victory over rival Danny Romero were career highlights. 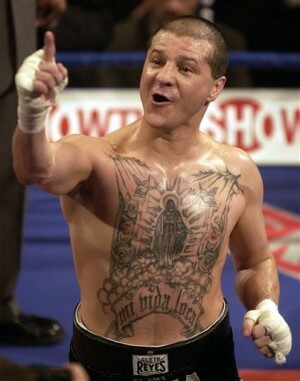 Tapia finished his career 59-5-2, with 30 knockouts. Then this afternoon news broke that former multiple time & division champion Paul Williams was in a terrible motorcycle accident. An accident in which the former champ had been paralyzed from the waist down. Some reports indicated that MRI’s and x-rays determined no body movement below the waist as a result of detaching 90% of his spinal cord. Williams, who lives outside of Atlanta, was on his motorcycle making his way into the city when apparently a car started to merge into his lane. In an effort to get out of the lane Williams himself swerved and put himself in the path of oncoming traffic. He made a move to get out of that lane and wound up riding up an embankment losing control of the motorcycle before flying into the air landing on his back on the road. Williams record stands at 41-2, with 27 knockouts. The Punisher had just signed last week to take on current 154 lbs champion, Saul “Canelo” Alvarez on PPV in September. But that’s besides the point. It’s a sad couple of days for the boxing world. Thoughts and prayers go out to the family of Johnny Tapia hoping he has finally found peace and to Paul Williams and his family, hoping he can show the fight and drive that made him a major talent in the sport of boxing.